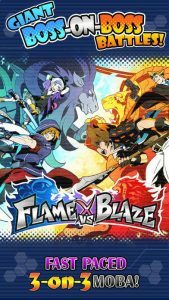 Square Enix’s fast-paced 3-on-3 action MOBA (Multiplayer Online Battle Arena), “FLAME vs BLAZE”! 3-on-3 action for up to 6 players on smartphones and tablets! Take control of unique agents in this spectacular 3D team-based action game! Easy to pick up with simple and intuitive tap-based controls to move, attack, and use flashy skills! Fulfill mission objectives to earn rewards, such as the premium “Topaz” currency to buy cards or agents in the Shop! You can also obtain agent stories and agent-specific equipment cards by clearing Agent Missions! I love the art in this game and it’s a fun concept but I constantly feel overpowered by players that they match me with. Even the AI is way stronger than me! So that makes the game a little less fun. But it’s still pretty fun.